A spectacular custom lacquered finish Italian ceramic Lion table lamp by Steve Chase. The Italian ceramic lion is by Bitossi. 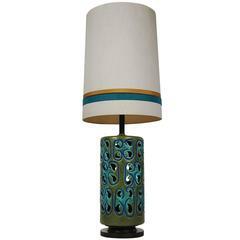 This lamp was custom order by Steve Chase for a project in Rancho Mirrage. The shade is the original vanilla linen shade so it shows minor age. Overall dimension: 26” high 21” wide 12” deep. Base is 15” wide 8” deep. 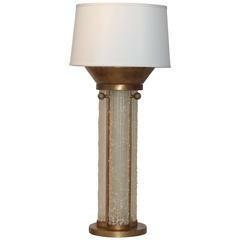 Lucite, glass and brass floor lamp designed by Steve Chase. 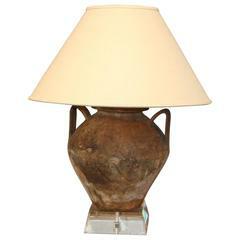 This lovely geometric design ceramic lamp with its lava like glaze was made in Italy. 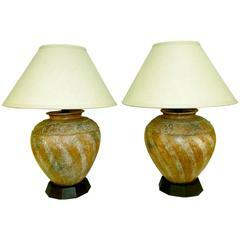 Handcrafted volcanic glaze ceramic lamp with double Venus symbol design applied. 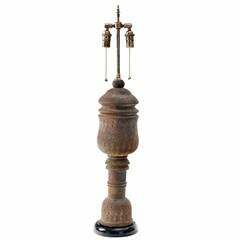 Double socketed with solid brass hardware with pull chains, Italy, 1960s.